We’ve had some fantastic covers for the annual Margaret River Short Story Competition collections, and now we can add another one to the mix. 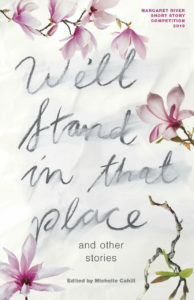 We are excited to reveal the cover for the upcoming 2019 Margaret River Short Story Competition anthology, We’ll Stand in That Place and Other Stories, edited by award-winning author and editor Michelle Cahill and featuring the winning story ‘We’ll Stand in That Place’ by Kit Scriven. Thanks, as always, to designer Susan Miller who has been responsible for the anthology covers over the years. We’ll Stand in That Place and Other Stories will be released in June 2019 through Margaret River Press.